Vaccine injuries can and do happen—to previously healthy children and adults. Consumers deserve to know the facts about the full range of vaccine risks. In most public health communications about vaccination, officials gloss over vaccine risks, dismissing any possible “side effects” as mild. Over the vaccine court’s 30-year history, individuals and families have filed over 20,000 petitions for vaccine injury compensation. This month, even as 12% of filed petitions remained unadjudicated, the payouts crossed over the $4 billion threshold. This amount was awarded in response to barely a third (31% or 6,276) of the filed petitions. There is no telling how much more money the taxpayer-funded program might have shelled out if the court had not chosen to dismiss the remaining petitions (56%)—possibly doing so fraudulently in at least some cases. Children’s Health Defense recently called attention to a glaring example of the NVICP’s pro-industry and anti-vaccine-injured bias. In 2007 and 2008, DOJ attorneys exhibited “highly unethical and appallingly consequential official misconduct” during an Omnibus Autism Proceeding (OAP) orchestrated to determine the fate of 5,400 families who had filed claims for vaccine-induced autism. The potential value of the claims exceeded $100 billion—an amount that “would have bankrupted the [compensation] program many times over.” HHS’s Department of Justice lawyers, “under pressure” to deprive petitioners of their rightful relief, successfully achieved that aim through allegedly fraudulent means. In September 2018, Children’s Health Defense Chairman Robert F. Kennedy, Jr. and Rolf Hazlehurst (parent of one of the vaccine-injured children involved in the OAP) requested that the DOJ Inspector General and Congress investigate this fraud and obstruction of justice by HHS and DOJ officials. In the Vaccine Injury Table, however, the only place where cardiac symptoms are mentioned is in connection with anaphylaxis—with the table’s notes indicating that “there are no specific pathological findings to confirm a diagnosis of anaphylaxis”—and most autoimmune illnesses are also conspicuously absent. By anyone’s accounting, the $4 billion paid out to date by the NVICP is an attention-getting amount of money. 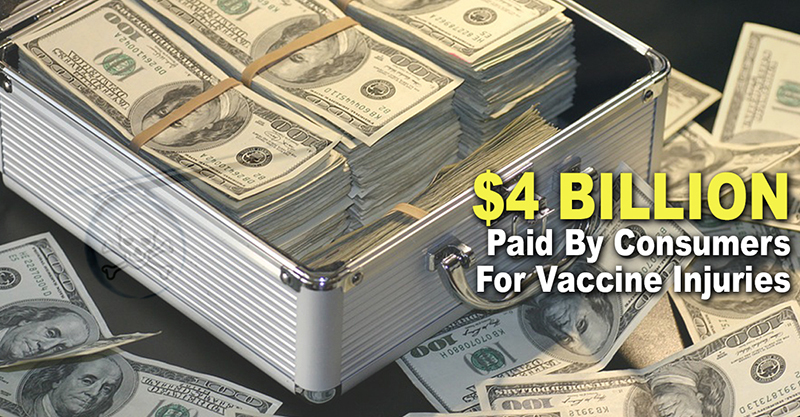 However, that amount pales in comparison to the billions of dollars’ worth of autism claims that the vaccine court unfairly dismissed. According to HHS, moreover, “fewer than 1% of vaccine adverse events are reported,” and studies confirm that many health providers are unfamiliar with the system for reporting vaccine injuries. The shocking underreporting of vaccine injuries also fails to account for the fact that one in six individuals who experience an “adverse event following immunization” (AEFI) have a recurrence with subsequent vaccination, often rated as “more severe than the initial AEFI.” If even a small percentage of these unreported and recurrent vaccine injuries were brought forward for compensation, the entire NVICP house of cards—and the CDC’s deceptive claims of unassailable vaccine safety—would crumble. With no incentive to make vaccines safe and a large and lucrative market guaranteed by the Centers for Disease Control and Prevention’s childhood vaccine schedule—as well as a growing effort to foist unnecessary and dangerous vaccines on adults—vaccine manufacturers appear to have it made.